We have touched lightly on the Kennel Club and the new Judges Competency Framework. Haven’t done a lot about it because it’s boring (over 30 pages and counting) and on here, except for Friday and Health, it is tried to keep things more to the shorter soundbite type of posting. Folk have a heck of a lot to do in their day and if they were expected to read reams on here we’d quickly fall off their “to do” list. At Welsh Kennel Club though, and subsequently by various emails, the matter of the JCF has come up. Glen of Imaal Terrier people do not seem to have taken on board the huge change that will be happening in the very near future regarding judges in this country. In view of this (and our byline of Keeping Glen of Imaal people up to date) we will start to cover the JCF in more detail; beginning with Appointment of Judges at Limited, Open and Championship Shows Without CCs from 2019 Onwards. This is the one that will probably affect the bulk of Glen people. Even if you don’t really want to do “big things” but think a bit of judging might be for you and you’ll see how things go you need to be fully aware of the JCF because from 2019 you’ll no longer be able to “just do it”. Please take time to read it. VB (1) Donvaleset Domino strong skull with good width . good bite , good quality bone ,good depth of chest, correct firm topline , good harsh coat , in good conpdition for age moved o.k. 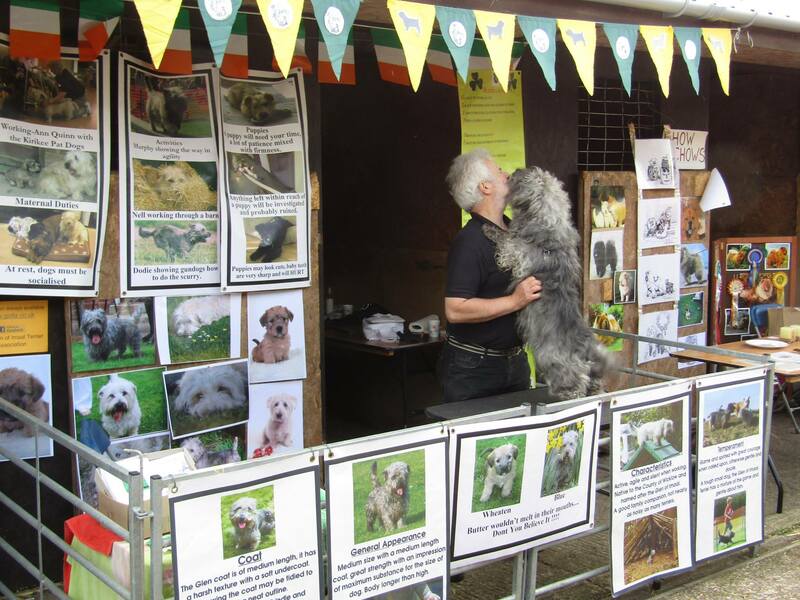 Glen of Imaal Terrier folk certainly believe in getting the breed out there. A weekend in Kentucky for Finnabair Double D Friend of a Friend results in a full set of Group placements, one through to four. Tipperary American Girl took a couple of days in Ohio and took home 2x Group 4 and one OHG2. Newtown Kennel Club saw Kilkenny’s Best of My Love take Best of Breed. Elm City KC was a BOB for Kilkenny’s Granite Glen Rooney (and an OHG4) and she also took it at Ox Ridge KC. Over in Europe it was the big Terri-Eri 2017 in Finland where Gleann Curvy Corvette took BOB with brother Cotton Cody Best Dog. Tervakoski All Breed saw Glenrosedale Buagh Ri Arthur Milo triumph in the breed whilst Rosears Master of The House was BOB at Mantyharju Show and picked up a very nice Group 4. Gleann Holly at Spirit of Ireland took BOB at Ahlen in Germany. Unfortunately no Glens were entered on the Irish circuit, such a shame. South Wales Kennel Association (postal) entries close today. Glen of Imaal Terriers will be judged by Muriel Bailey and terrier Day is Sunday 8th October. Online entries close on September 4th.